10 F None No Power Seat 10 F is a standard Economy Class seat that is missing a window. 13 A None No Power Seat 13 A is a standard Economy Class seat that has extra legroom due to the exit in front however, also has limited to no recline due to the exit row behind. The tray table is in the armrest, making the armrest immovable and slightly reducing seat width. There is no floor storage for this seat during takeoff and landing. 13 B None No Power Seat 13 B is a standard Economy Class seat that has extra legroom due to the exit in front however, also has limited to no recline due to the exit row behind. The tray table is in the armrest, making the armrest immovable and slightly reducing seat width. There is no floor storage for this seat during takeoff and landing. 13 C None No Power Seat 13 C is a standard Economy Class seat that has extra legroom due to the exit in front however, also has limited to no recline due to the exit row behind. The tray table is in the armrest, making the armrest immovable and slightly reducing seat width. There is no floor storage for this seat during takeoff and landing. 13 D None No Power Seat 13 D is a standard Economy Class seat that has extra legroom due to the exit in front however, also has limited to no recline due to the exit row behind. The tray table is in the armrest, making the armrest immovable and slightly reducing seat width. There is no floor storage for this seat during takeoff and landing. 13 E None No Power Seat 13 E is a standard Economy Class seat that has extra legroom due to the exit in front however, also has limited to no recline due to the exit row behind. The tray table is in the armrest, making the armrest immovable and slightly reducing seat width. There is no floor storage for this seat during takeoff and landing. 13 F None No Power Seat 13 F is a standard Economy Class seat that has extra legroom due to the exit in front however, also has limited to no recline due to the exit row behind. The tray table is in the armrest, making the armrest immovable and slightly reducing seat width. There is no floor storage for this seat during takeoff and landing. 14 A None No Power Seat 14 A is a standard Economy Class seat that has extra legroom due to the exit in front. The tray table is in the armrest, making the armrest immovable and slightly reducing seat width. There is no floor storage for this seat during takeoff and landing. 14 B None No Power Seat 14 B is a standard Economy Class seat that has extra legroom due to the exit in front. The tray table is in the armrest, making the armrest immovable and slightly reducing seat width. There is no floor storage for this seat during takeoff and landing. 14 C None No Power Seat 14 C is a standard Economy Class seat that has extra legroom due to the exit in front. The tray table is in the armrest, making the armrest immovable and slightly reducing seat width. There is no floor storage for this seat during takeoff and landing. 14 D None No Power Seat 14 D is a standard Economy Class seat that has extra legroom due to the exit in front. The tray table is in the armrest, making the armrest immovable and slightly reducing seat width. There is no floor storage for this seat during takeoff and landing. 14 E None No Power Seat 14 E is a standard Economy Class seat that has extra legroom due to the exit in front. The tray table is in the armrest, making the armrest immovable and slightly reducing seat width. There is no floor storage for this seat during takeoff and landing. 14 F None No Power Seat 14 F is a standard Economy Class seat that has extra legroom due to the exit in front. The tray table is in the armrest, making the armrest immovable and slightly reducing seat width. There is no floor storage for this seat during takeoff and landing. 29 A None No Power Seat 29 A is an Economy Class seat in the last row of the aircraft that may have limited to no recline. The close proximity to the lavatories and galley may be bothersome. 29 B None No Power Seat 29 B is an Economy Class seat in the last row of the aircraft that may have limited to no recline. The close proximity to the lavatories and galley may be bothersome. 29 C None No Power Seat 29 C is an Economy Class seat in the last row of the aircraft that may have limited to no recline. The close proximity to the lavatories and galley may be bothersome. 29 D None No Power Seat 29 D is an Economy Class seat in the last row of the aircraft that may have limited to no recline. The close proximity to the lavatories and galley may be bothersome. 29 E None No Power Seat 29 E is an Economy Class seat in the last row of the aircraft that may have limited to no recline. The close proximity to the lavatories and galley may be bothersome. 29 F None No Power Seat 29 F is an Economy Class seat in the last row of the aircraft that may have limited to no recline. The close proximity to the lavatories and galley may be bothersome. On select aircraft, Wi-Fi access is available to all passengers via Aerolíneas Argentinas eXWireless system. This aircraft is primarily flown on short-haul routes and features a two class configuration with 8 Club Economy recliner seats and 162 standard Economy Class seats. The majority of the B737-800 in this fleet are equipped with winglets to increase fuel efficiency. I had paid an additional U$S 210 to change my Economic seat from Buenos Aires to Rio, I think it is not worth the price! Too expensive to have the same service that you have in Economic, and also the seat doesn´t have any storage space in the overhead bin! Bad choice. No reclining seats, uncomfortable. The seat is missing a window, it's true. It was a pity that I didn´t visit seatguru before the flight!!! Excellent legroom because it's first row (there's no row 1 for starboard side) However, seat width is a disaster, because it's marketed as Business Class when the aircraft is a single-class one. the registration is LV-FWS. 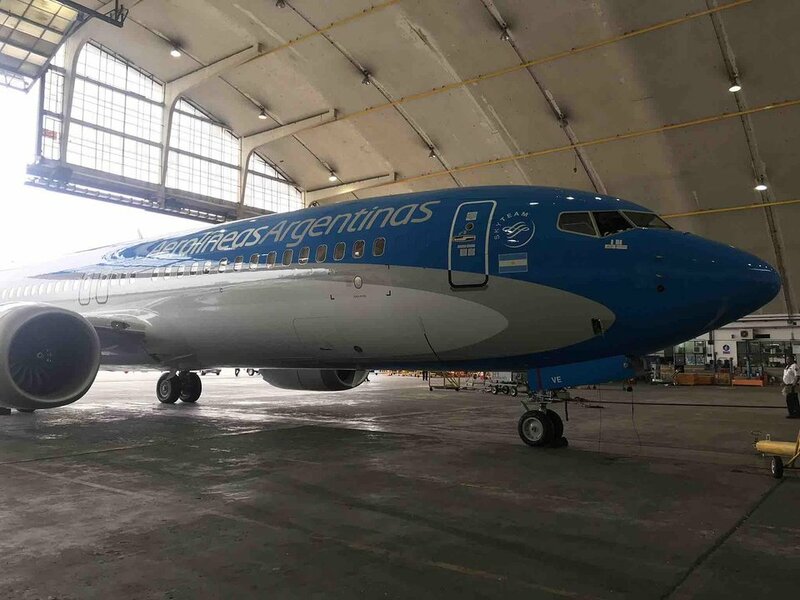 Aerolineas Argentinas flies 1 versions of Boeing 737-800.